The Southsea midfielder has put pen to paper on a new deal to keep him at his boyhood club until the summer of 2021. It comes as reward for Close after another impressive season. He’s been a key player during the League One promotion push – especially following loanee Ben Thompson’s return to Millwall in January. 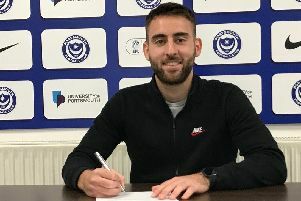 The academy graduate has scored six goals in 39 appearances and started Pompey’s past 15 matches. Close is delighted to have signed a fresh contract at the Blues. And with Kenny Jackett’s men firmly in the race to finish in the top two, the 22-year-old is hoping he’ll be playing in second tier next term. He said: ‘I’m delighted to be at the club for another few years and now I can’t wait to kick on. ‘You need the manager’s faith and a chance to play football – and he gave me that pretty early on. ‘It’s been nice to get a few more goals this season and that’s a part of my game I want to keep improving. ‘The progress this club has made in the past few years shows that we’re only moving in one direction. Craig MacGillivray, Jack Whatmough and Gareth Evans have also signed new Pompey deals this season.